Since you brought your sofa into the home, how many hours do you think it has been in use? How many different people have set on the sofa? How many pets have taken a nap there? How many sodas and snacks have been spilled on the sofa? Clearly, your sofa has seen a lot of action. The same can be said for a lot of other furniture around the house like recliners, futons, love seats, beds and chairs. Sooner or later, that furniture will either wear out or need to be replaced because you’re remodeling. Instead of cramming your old furniture into the garage why not get rid of it? That’s a job that Junk King San Diego can handle from start to finish. 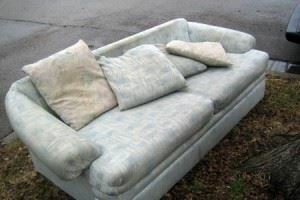 Some people attempt to get rid of furniture by putting it on the street. Unless you happen to be driving down the street the moment that piece of furniture gets placed on the curb, chances are it’s going to be ruined in a matter of minutes. It only takes one dose of sprinklers or from a dog to totally trash a sofa. That means it sits there until the city gets around to picking it up which could be several weeks. The smarter move is to hire Junk King San Diego. These are professional junk haulers that have a lot of experience removing all kinds of furniture from a home. The majority of furniture in your house was probably brought in by two movers. That means it has to be taken out by two movers. That is exactly what Junk King is going to provide to you. Each one of their sessions is staffed by two movers with a lot of experience in this type of work. These are crews that know the proper form for lifting heavy objects. They do it all day long. Don’t put your back at risk. The Junk King crew to pick up what you want to get rid of right from the spot. As for pricing, you won’t be charge by the pound with Junk King. Instead the crews are going to pack up all your stuff onto the truck and as little space as possible. That’s important because it is how they base their price schedule. They’ll provide you with an estimate before they begin the work. Whatever that cost is agree to will be the final cost. There won’t be any surprise charges. If you want to take care of furniture removal and junk hauling the right way, then Junk King San Diego is the only way to go. This entry was posted in Uncategorized on September 27, 2017 by Junk King. Last updated September 27, 2017 .